Flagships signify the lead ship guiding a fleet, and today flagship stores act similarly for a retailer guiding their store portfolio with innovative concepts, technology and merchandise. 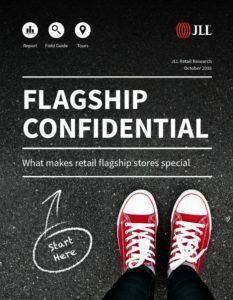 While luxury brands have used flagship stores for years to connect with customers and grow brand recognition, JLL’s latest research report Flagship Confidential, shows an increase in retailers across all price points using a flagship store strategy. The report, which looks at 145 flagship stores in New York, Los Angeles, Chicago and San Francisco also found 11 common key features amongst these retailers. Customers get to live the suite life in luxury stores: JLL categorized the flagships into five different price point groups and found that 40 percent of the stores fell into the luxury and luxury lite retail category. The upscale nature of these flagship stores seek to offer ultra-personalized experiences that deliver a one-on-one connection to shoppers. Luxury and luxury lite stores also had a direct correlation to having the highest concentration of hospitality and wellness features, like restaurants, cafes, coffee bars and VIP rooms with high-touch hospitality service. “New York City, which had more than half of the luxury flagships in our study, caters to wealthy shoppers with invite-only VIP suites, private fitting rooms, lounges and salons. Chanel on 57th Street contains a private fashion salon housing exclusive designs that will soon undergo a $3.8 million dollar renovation,” added Cook. High-tech, high-reward: Nearly 60 percent of the flagships that showcased emerging technology fell into the high or middle price point category. These middle-of-the-road retailers primarily use technology to connect with a broad swath of customers more intimately and cost-effectively. The purpose of technology in store varies from social and informative to discovery, but has evolved to be more practical.“Sunglass Hut on Fifth Avenue features an interactive sunglass display called Social Sun that allows customers to take and share photos of themselves. In Lululemon’s New York flagship, shoppers will find an interactive, touch-screen mirror that allows them to discover local fitness studios,” added Cook. Meet Me in the Middle: A noticeable trend among middle and discount retailer flagships is offering expanded or exclusive selections to entice customers. Fast-fashion retailer H&M’s Los Angeles flagship carries higher-end products not found in the chain’s regular stores and it was the first location to offer all the retailer’s product lines under one roof. At Converse flagships shoppers can customize products like shoes or hoodies with their own designs at the Ink Bar, and there are even graphic designers on hand to assist with the process.